Faster and more reliable than last year's 840 EVO, the 850 EVO is a great SSD that just misses the price/performance sweet spot. 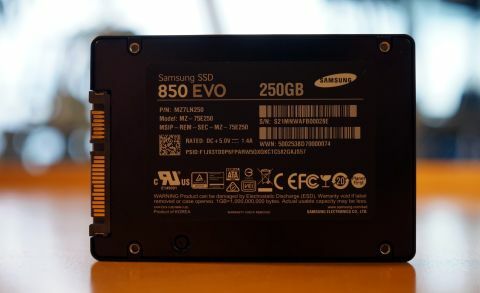 For the past year, Samsung's 840 EVO SSD has been a benchmark for SATA SSDs. Crucial’s MX100 surpassed it, offering a slightly faster drive at a slightly better price, but the 840 EVO is still one of the best drives available when it comes to price and performance. That means the 850 EVO has a lot to live up to. Can it take the best of the new high-performance Samsung 850 Pro and offer it in a cheaper, consumer-focused SSD without sacrificing speed? The answer is yes, but speed isn’t what’s exciting about the 850 EVO. It’s only marginally faster than its predecessor, the 840 EVO, and with the limitations of the SATA interface, it isn’t as fast as some PCIe SSDs. If you already own an 840 EVO or a similarly speedy SSD, there’s no reason for you to run out and upgrade to the 850 EVO. Instead, there are two enticing selling points for new customers: improved durability and a new five year warranty. The 850 EVO is built to last. And, yeah, it’s pretty fast, too. 850 EVO: 75 terabytes of writes for 120/250GB models. 150 terabytes of writes for 500GB/1TB models. 840 EVO: 40 terabytes of writes for 120/250 GB models. 80 terabytes of writes for 500GB/1TB models. Samsung guarantees that the 850 EVO will function after nearly twice as many data writes as the 840 EVO, which gives it that nice bump up to a 5 year warranty. To write 75 terabytes of data to the drive in five years, you’d have to do 40 gigabytes of writes every day. And these are just the guarantees; a year-long endurance test at The Tech Report saw an 840 EVO survive for 700 terabytes of writes before giving up the ghost. The improved performance and endurance of the the 850 EVO comes from some new technology Samsung has implemented: 3D V-NAND, stacking 32 layers of cells on top of one another. That technology doesn’t have any bearing on using the drive day-to-day, but if you want more detail, Anandtech has you covered. As you can see, all the drives returned similar results, with just a few standout categories. The SanDisk Extreme II and Samsung 850 Pro delivered very fast sequential reads, but all of Samsung’s SSDs stayed pretty competitive. The 850 EVO’s slower random write speed is partially due to its size of 250GB compared to the other two 1TB Samsung drives we hand on-hand. Anandtech found that the 1TB model of the 850 EVO performed about 50 MB/s faster in 4K random reads than its 250GB version. Our benchmarks with ATTO show how consistently the drives perform, but you can see that the 850 EVO has a slight speed edge over the 840 EVO, and continues to ramp up in speed at larger transfer sizes, unlike the Sandisk Extreme II. The Samsung 850 EVO is plenty fast, and its reliability will be a great benefit for anyone doing gigabytes of writes on a daily basis. Price is where the 850 EVO falters. Amazon is currently selling pre-orders of the 250GB drive for $140, which is $10 cheaper than its MSRP. The 840 EVO performs similarly in most use cases—you’ll be hard pressed to notice the speed difference—and only costs $125 for 250GB. And the Crucial MX100—which we didn’t benchmark, but is the current go-to recommendation for a cheap, high-performance SSD—costs only $110 for a 256GB model. The Samsung 850 Pro and Sandisk Extreme II are more premium-priced SSDs at $175 and $185 for 250GB and 240GB, respectively. For gaming and general system usage, there’s little perceivable difference between the consumer and “professional” drives. You don’t need to spend more. It’s hard to recommend the 850 EVO over the MX100 unless you’re particularly worried about SSD longevity, or want that five year warranty (Crucial’s warranty is three years). Samsung does offer one other bonus in the form of its Magician Software, which includes a cool feature called Rapid mode. Rapid uses some of your RAM as a cache to speed up transfer performance. It turns in incredible benchmark numbers in some tests (up to 6 GB/s! ), but is slower in other situations. It’s not enough to justify the higher price. Here's the MSRP breakdown for each 850 EVO model. The 250GB 850 EVO is a great SSD that’s about $30 too expensive to be the best price/performance bargain out there. If Amazon slices a few more dollars off the price, this will be the SSD to get.